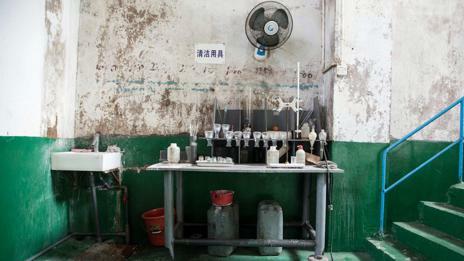 Via BBC and the Unknown Fields project, a lab (note buret) at a rare earth mining/processing facility in Inner Mongolia. (What does the sign on the wall say? "Wear safety goggles", I suspect. I suspect it means "cleaning equipment", but I am basing that on Japanese, not Chinese. The second character must have a different meaning in the two languages. To CJ: I see you notice burette. I also notice that something came off the wall ( a shelf but not fume hood) and you can see it left some kind of footprint behind. It seems to me that wash area and other fixtures are a later edition. I wonder if the black magic spammers you keep getting can help out with this. That must be where they titrate the acid waste before disposing it in the toxic lake of DOOOOOOOOOOOOM! My God. My home lab when I was a kid (1960's) was better than that. I even had a homemade fume hood lined with transite (yeah, asbestos cement). Even had a decent bench and in later years, a homemade pH meter. The green tank under the table on the left seems to contain base bath. There is a white residue on the top of the tank. Bleg: reactions that show conservation of mass? Why do plants flare, anyway? Food service, yes. Door-to-door, no. Medicinal chemistry: "not a commodity"
Job search apps are so great!